Most beautiful and best place that I have ever stayed. Everything was well taken care of. What an incredible property! Like nothing we're ever experienced in the Blue Ridge area. I was wondering about the mixed review with one saying the appliances and furnishings were "outdated." Unless you're looking for a sub-zero fridge, the appliances are very up to date and the house was extremely well decorated (maybe they fully updated everything since that review?). We had lunch at the gazebo at the top of the waterfall and hung out that night at the firepit at the bottom of the waterfall. Everyone in our group thought is was awesome - especially the kids who got to make s'mores! I wish there was a way to rate our experience a 6 out of 5. Friendly staff. Very polite and helpful. The staff was amazing during our entire stay. Very friendly and welcoming, and even gave us a courtesy call to check on us and make sure everything was going great! The property was amazing. We only had one issue with a large trash pile up due to Hurricane Irma going through a few days before we arrived. We were able to contact the office, and the following day they sent out someone to fix the issue. Again, outstanding rental agency, staff, and all around company. As always everyone in the office was very helpful. The original property I rented was taken out of the rental program. I needed something that was wheelchair accessible and they worked with me to find the perfect place. We had family on Sunday from age 6 to 89. Everyone had a wonderful time. The office staff is outstanding! The property has a stunning view of the mountains and Lake Blue Ridge! Rooms were awesome, and the outdoor fireplace and hot tub area were fantastic! Ray and a lovely young lady in the office were particularly helpful on the day I picked up the info for the honeymoon suite. I was exhausted already, and they were simply kind and patient with me... outstanding service! My daughter loved it! Thank you! I've spoken with Kim multiple times, Amy, and Ray (plus one other girl in the office), and everyone was so helpful, courteous, and friendly each time! It definitely added to our vacation experience and wonderful memories, which is why we booked the same property again and really look forward to returning! We thoroughly enjoyed our stay in the gorgeous penthouse suite, which is perfectly located and impeccably decorated. The furnishings were very comfortable. We also loved the privacy and spaciousness of the deck! We didn't want to leave. We hope to return. Thanks for providing a beautiful property for our family to enjoy. The team was extremely thorough and helpful. We appreciated the detailed directions as cell service is spotty. Creeksong is an amazing combination of nature and comfort. When you are facing the stream you feel like you are out in the woods miles from everything-then you turn around and remember you are also staying in a comfy, clean and beautiful cabin. Best of both worlds. I had a few questions prior to making my reservation and my questions were answered using the Chat feature as well as a phone call prior to actually choosing the cabin I was looking at. I was extremely pleased with the ease of check in and impressed with the follow up phone call I received the day after my 1st night stay. It was a great experience overall working with the friendly staff. Pioneer Point was a dream getaway. The views from the cabin were amazing. The amenities were fantastic and I would definitely stay in this cabin again. A great family vacation with lots of new memories in Blue Ridge! Second time using this management company and exact cabin. Everyone is wonderful. Will be staying again next year. The cabin is nice and secluded. Very beautiful and has everything you need for the week. The staff at Southern Comfort Cabin Rentals were outstanding. I spoke to them several times over the phone and they handled every worry or concern with a positive and helpful attitude. I needed to switch payment a day late and they were able to take my request without frustration and instead matched it with a quick and happy response. Checking in was a breeze thanks to the staff member at the front desk who was full of suggestions and ideas for what to do within town. I was so happy to work with such pleasant and engaging individuals at Southern Comfort! I can tell you my searches will be so much easier now as I know straight where to look first! Look no further than Southern Comfort Cabin Rentals! Searching for a cabin rental with your coworkers can be a little overwhelming. Everyone has different tastes and ideas of what they want and there are so many locations and rental companies to choose from. Once we stumbled on Hooked on a Feelin, we knew immediately it was what we wanted. 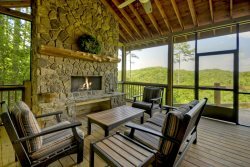 Mountain views, a hot tub and games including shuffleboard, beautiful outdoor furniture in front of a fireplace and tv, and large oversized windows quickly caught our attention. Then we went inside to the incredibly spacious rooms that were decorated with modern furniture and ammenities. There was plenty of space for all of us and then some! We loved the ability to have separate alone time, but also the numerous common areas we could all join in and create memories. This location was perfect as it was only 10 minutes from downtown and the grocery stores and food stops. we will definitely be using Southern Comfort cabins again! From the very beginning of the search process to booking and then to our actual stay - everyone that we encountered at Southern Comfort was extremely helpful, friendly and service oriented. We had assistance from Ray, Kim, and Amy. All of them went out of their way to make sure our questions were answered and that we were settled comfortably. Very impressed with their service. The cabin was clean and well maintained. This was our first time with Southern Comfort Cabin Rentals (we have used several others) and we will definitely recommend them! A great overall experience! Thank you! The Mountain High Cabin was really beautiful. The view was incredible - peaceful and amazing! Cool mornings out on the deck with our coffee and the beautiful sounds of the mountain life. Evenings spent watching the sunset over the amazing mountain view. The cabin seemed very new. It was well maintained and beautifully decorated. It was very clean and since I am a clean freak I loved that I didn't have to spend time cleaning it to my standard before I stayed! We enjoyed time in the jacuzzi, making a fire in the outdoor fire place, and just enjoying the amazing views from the deck...all really nice features of this property. The time inside the cabin was also nice and relaxing and comfortable. We felt that we were tucked away, but not too much, as we were able able to venture out into the town of BlueRidge and all its beautiful surroundings! We have stayed with Southern Comfort Cabins three times in the last four years, The one year we did not we went with another company because they had more available Toccoa River properties. That cabin had a great location but was a tired, old cabin in need of work. We have had three wonderful cabins with Southern Comfort and we are sold on you guys. You have a great staff, you have good procedures, your cabins are extremely well maintained, and you have a great website. We feel comfortable using your services.We work hard for our money and it is nice to know there is a Company that maintains quality cabins with equal value. Blue Sky lodge is a peaceful, serene, well maintained property with incredible views. It is within minutes of everything one needs for a fantastic well-rounded get away adventure. The cabin is laid out well with enjoyable space and the location is as quiet as a mouse. You can lounge in about any room in the cabin. Everything worked fine. My family reported that all beds slept well. There is no doubt we would enjoy another visit to this property. Hotty Toddy!